All the cool kids are doing it, you know. 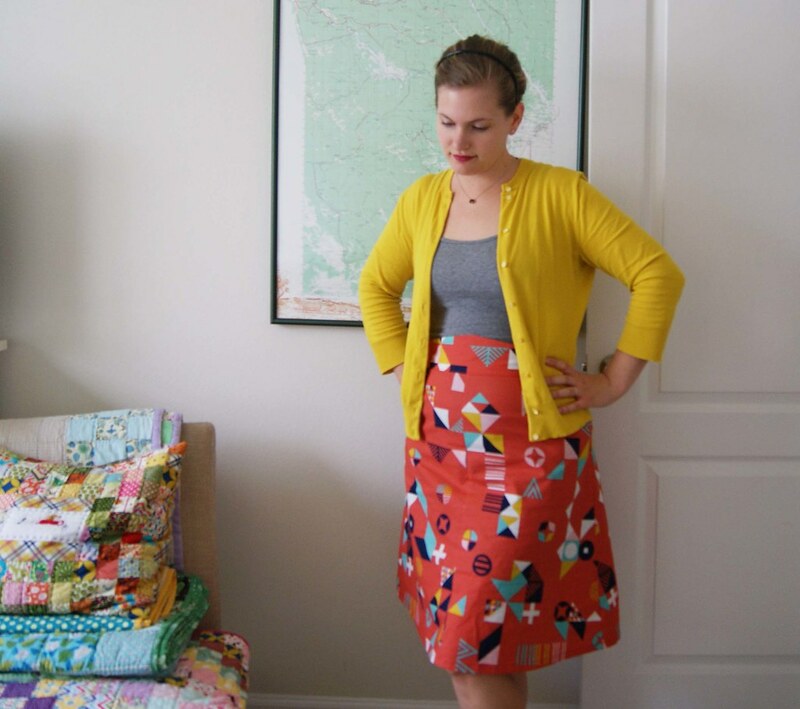 Suddenly, we’re all making dresses and skirts, not just bags and quilts. Or is it just me? Has everyone been doing this all along, and just not really saying much about it? All through vacation (it was lovely, I am not tanned, and I am way behind on everything blog-related, so thank you very much), I plotted and planned and dreamed, and even bought a little bit of fabric. And when I got home? The second thing I did (after going to guild meeting on Saturday, natch) was sew up my Tsuru motif madness Ginger skirt. I’m still a zipper chicken, but I managed to install the invisible zipper in this skirt with a minimum of teeth-gnashing. It doesn’t look awesome, but it looks fine, you know? 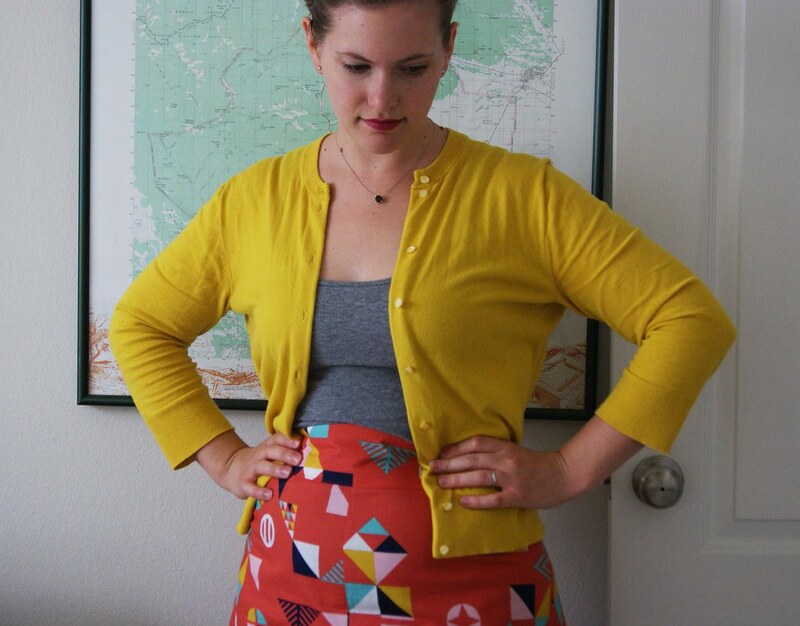 Zipper-gnashing and cutting included, I sewed this skirt start to finish in 2.5 hours. So much payoff, for so little time invested. When I first tried it on, I wasn’t sure. I didn’t know if the high waist was flattering on me (Lucy left behind some serious luggage, if you know what I mean), and I thought the print might make me look…crazy. 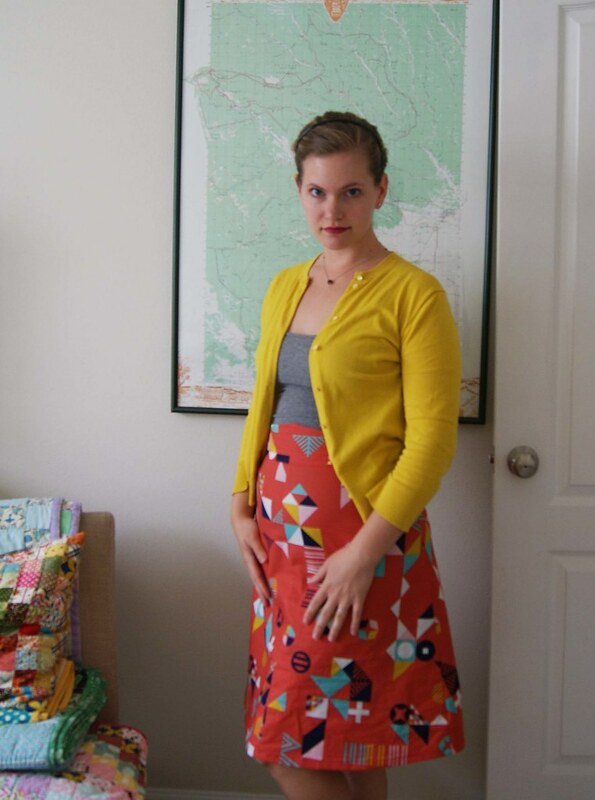 Keep your thoughts to yourselves re: the crazy, but I’m wearing this skirt for-real today, and I love it. Going to make the next one out of some Liberty. Yep, sold out, I cleaned ’em out again. I didn’t forget Lucy in my wear-homemade mania. 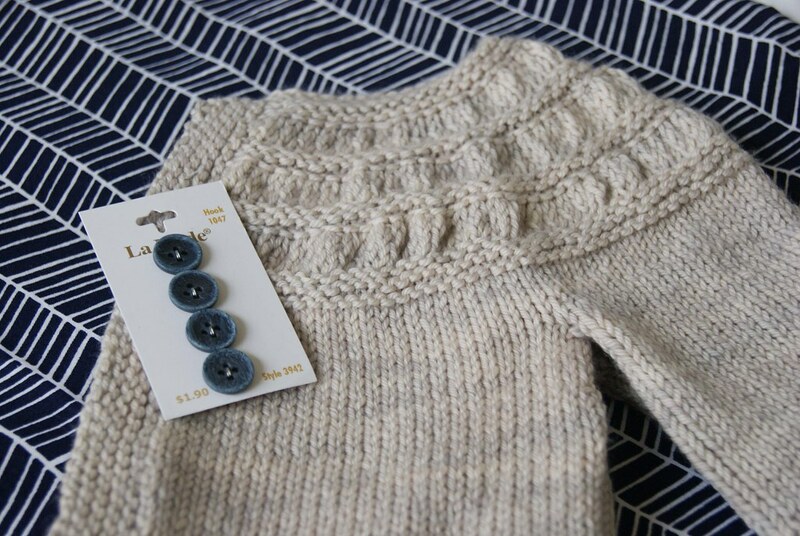 I’ll put this on her and take real photos as soon as I sew on the buttons–but this is her Tiny Tea Leaves Cardi, knit from madtosh DK Twist, Doe Eyes (the April Mag Society yarn club “neutral” colorway). I tried it on Lucy yesterday to see how big it was on her skinny shoulders, and she flatly refused to take it off. Good sign! 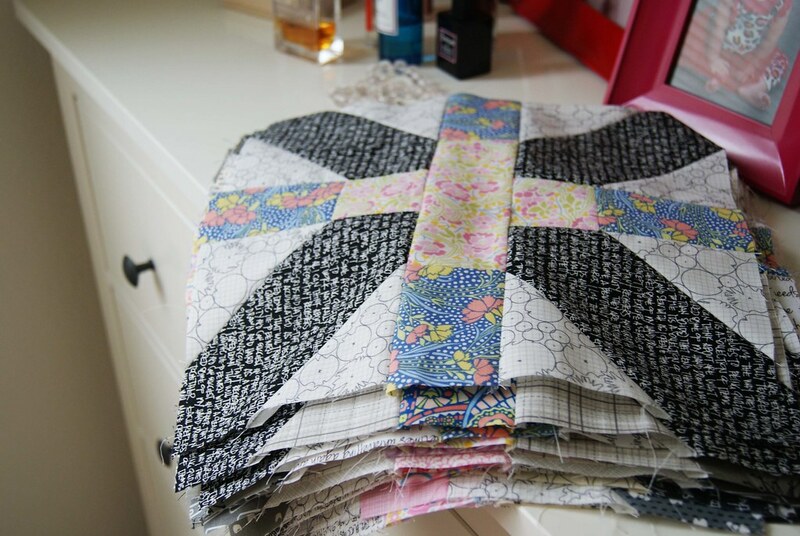 And…of course, there’s still quilting going on. Plenty of it. I have 20 out of 36 x-plus blocks done. I have the last 16 cut and ready to go. Need to apply my rear to the chair and just get them done. How about you? Are you making garments too? 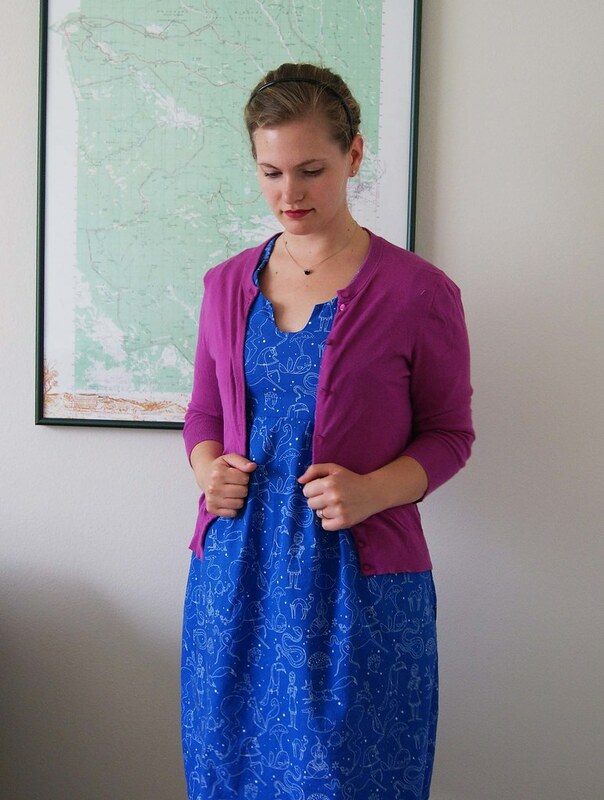 Have any favorite patterns to share? I’m particularly interested in patterns of the “flattering blouse” variety.